The streets were packed with smiley people as they ate, drank and shopped in the sunshine – and even a late afternoon deluge on the Saturday of the event didn’t dampen anyone’s spirits. There were 70 stalls in the producers’ market and two days of expert demonstrations ranging from beer and cocktails to fine dining recipes from top chefs. There was also an exclusive pop-up restaurant in the Ulverston landmark, the Hoad. Ten invited guests ate food prepared on site by Michelin-starred chef Kevin Tickle, from The Forest Side in Grasmere. Festival organiser Anna Lyttle, of CN Events, said: “What a fabulous weekend we’ve had in Ulverston. They don’t call it the festival town for nothing. There was such a great buzz around the streets and so many smiling people enjoying everything our great producers had to offer. “Yet again, the weather was kind to us. The downpour on Saturday didn’t arrive until almost the end of the afternoon so that didn’t spoil anyone’s fun. 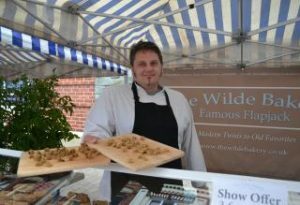 “We had more than 70 stalls throughout the town and some new activities too. The pop-up restaurant at the Hoad on Friday night was a great success and that’s all thanks to Kevin Tickle, the head chef of The Forest Side at Grasmere, and the fantastic team from the hotel. On Saturday night there was a comedy open mic event, organised by the brilliant folks from Another Fine Fest, and, throughout the weekend, The Sun Inn hosted a great beer festival too.